Several countries near the equator has been suffering due to extreme heat brought by the El Niño. And with the alarming case of global warming, it is predicted that the incidence of heatstroke cases and fatalities will also become more prevalent. Heat stroke is the most severe form of the heat-related illnesses when the body overheats and cannot cool down. The body cannot take off the excessive heat by sweating because of dehydration and/or humid environment. When the body temperature reaches higher than 41.1°C (106°F), it is associated with neurologic dysfunction. 1. Move the person to a shady spot or indoors and have him/her lie down with legs elevated. 2. If able to drink liquids, have him/her sip cool water in a SITTING position. 4. Apply ice packs to the armpits, wrists, ankles, and groin. 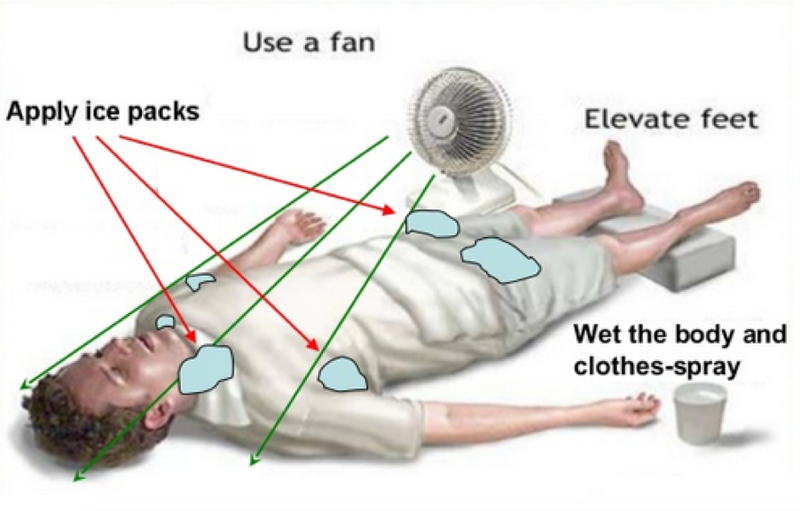 Heat stroke is considered a medical emergency and complication increases when the longer it takes to begin treatment. Limit the amount of time you spend outdoors. Avoid tea, coffee, soda, and alcohol. Wear a wide-brimmed hat & long- sleeved clothing when outdoors. Schedule heavy-duty activities for the beginning or end of the day, when it’s cooler. Behavioral responses are important in the management of temperature elevations and may provide clues to preventing the development of heatstroke.